Broken fragments of Somdet Phra Buddhacharn Toh Somdet amulets from Wat Rakhang and Wat Bangkhunphrom. 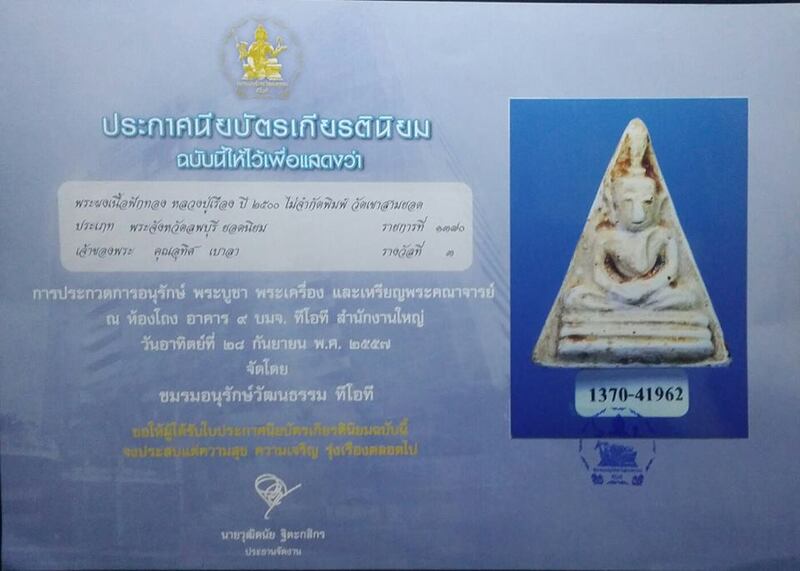 Filings of Phra Kring Wat Suthat that were consecrated in B.E. 2485. Somdet amulets that were given out by Luang Pu Poo, Wat Inn. Phong wiset that were leftover by Luang Phor Doem, Wat Nong Pho. Many types of powder specially donated by many famous monks, etc. Nur Phong Kesorn (powder of crushed jasmine flower petals). Nur Phong Kasen Boon Nak (special powder named after Naga). Nur Phong Kesorn Bua Luang (powder of crushed lotus flower petals). Nur Phong Kaset Pikoon (powder of a type of farm wood). Phra Thep Wae Tee, Wat Sam Phraya. Phra Pawana Koht, Wat Paknam. Phra Raj Molee, Wat Rakhang. Phra Pawana Wikrom, Wat Rakhang. Phra See Somphot, Wat Suthat. Luang Phor Chaeng, Wat Bang Pang. Phrakru Winai Ton, Wat Samphanthawong. Phrakru Sompanyop Rakat, Wat Prodges. Phra Acharn Plee, Wat Suan Ploo. Phrakru Arkom Soonthorn, Wat Suthat. Phra Acharn Baideega Banyat, Wat Suthat. Phrakru Mongkhol Wichit, Wat Anongkaram. Luang Pu Nak, Wat Rakhang. Luang Phor Sodh, Wat Paknam. Luang Pu Puak, Wat King Keaw. Luang Phor Chuang, Wat Bang Pae Rok Tai. Luang Pu Rian, Wat Nongbua. Luang Phor Roong, Wat Thakrabue. Phra Palad Taeng Guay, Wat Pradoochimplee. Luang Phor Chong, Wat Natangnok. Luang Phor Nor, Wat Klang Tharua. Luang Phor Samniang, Wat Weruwanaram. Luang Phor Ha, Wat Don Gai Dee. First Batch Somdej Khrong Waw Luang Phor Unn Wat Tankong BE2495. Material included Phong Phutthakhun and Phong Wisek created by Luang Phor Unn, together with old powder from Luang Phor Kaew Wat Kruewan. This batch of somdej is made earlier than Somdej Mien. It comes with Samakom Authentic Certificate. Attached with Gold Waterproof Casing. First Batch Somdej Phim Kai Boran, Luang Phor Parn Wat Bang Nom Kho BE245x. Whole piece with holy Phong Whisek. It won No2 Placing in Thailand BITEC Grand Amulet competition on 30th September 2018. Somdej Prok Pho Luang Phor Pherm Wat Pom Kaew BE2543. Nur Phong Yasut (Magical) with 5 gold takrut, made 799 pieces only. Serial Number 347. The material contained left over stuff from the mouth of Luang Phor Pherm. Can easily see LP’s hair on the amulet. It comes with original temple box.